IOGEAR’s David Greene gave me their adorable, tiny USB Optical Mini Mouse (“OMM”) after our PR meeting at this month’s Macworld Expo in San Francisco. I used it with our loaner Tekserve iBook as my personal mouse until I returned home to Arizona, when Barbara expressed interest in OMM. It certainly is small and light, weighing almost nothing and having roughly one-third the footprint of a standard Apple Pro optical mouse. Two-button left/right clicking plus wheel scrolling work in OS X without any additional software, and single-click + no scroll works in OS 9. A sliding switch on the side provides users with 400, 600, or 800 dpi resolution options of precise accuracy for mobile professionals (or ordinary folks). This link has comprehensive info, pictures, and specs for OMM from IOGEAR. I didn’t fall in love with OMM when under pressure to use it in the Moscone Center Media Room. My fingers had trouble figuring out where to hold and press, and my mouse tracking was consistently inaccurate. Turns out I’m not an ideal user of OMM, because even though my hand is smallish, I’m either too clumsy or too set in my ways to adapt quickly to it. 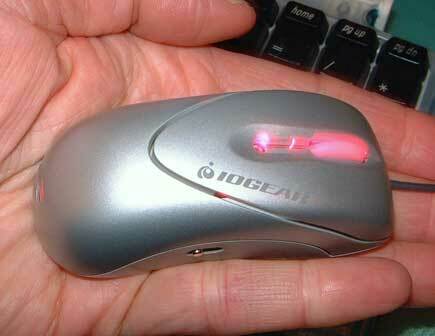 Stylish and well-constructed, IOGEAR’s Optical USB Mini Mouse comes with a long, thin cable. It’s too thin and delicate for serious long-term road warrior usage, which registers a demerit. OMM is packaged with a very small vinyl case, which is too diminutive for sensible, speedy storage. My suggestion to improve OMM is to make the cable more rugged, even if it has to be a bit shorter, and to make the case more ample and flexible for repeated insertion and removal. OMM travels and senses well on many typical and unconventional surfaces, but didn’t perform to my satisfaction of the smooth tables in the Macworld Media Room. You’ll be more efficient if you bring along a pocket-size mouse pad or equivalent. Trust me on this one. Will I use OMM? No, for personal non-technical reasons. Will Barbara? Ubetcha, and she’s already concerned I’m borrowing it for an hour to prepare this review, thinking I might not return it. Do I recommend it? Yes, for adults with small hands or precise digital dexterity, and for all children who are not too rough on their peripherals. 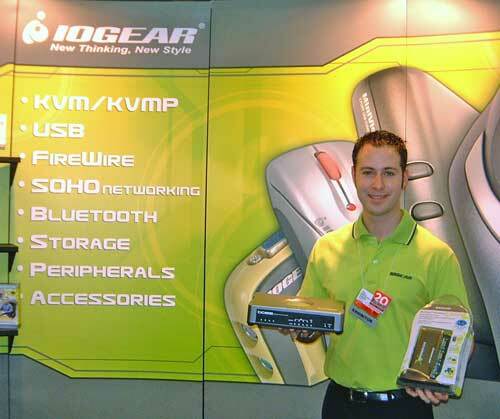 David Greene gave me a thorough tour of IOGEAR’s products, then made a promise to deliver many of them to MyMac.com labs for our testing and evaluation. 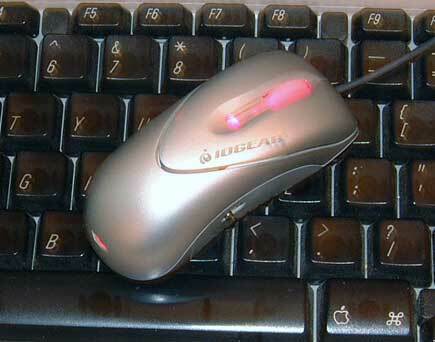 IOGEAR offers an extensive range of peripherals and accessories, many of which will appeal to our broad spectrum of MyMac.com readers. Watch this space for more on this company, and spend a few minutes looking through their web site.